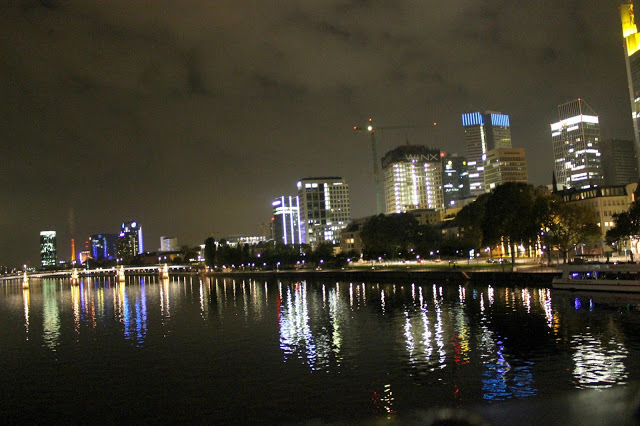 This was again one really fast trip, only two days I was stayed in Frankfurt and only a few hours I managed to discover the city, which actually was on late afternoon so the my photos are not the greatest! But everytime I have such a short trip, I always think that these were the most relaxing moments I had so far! 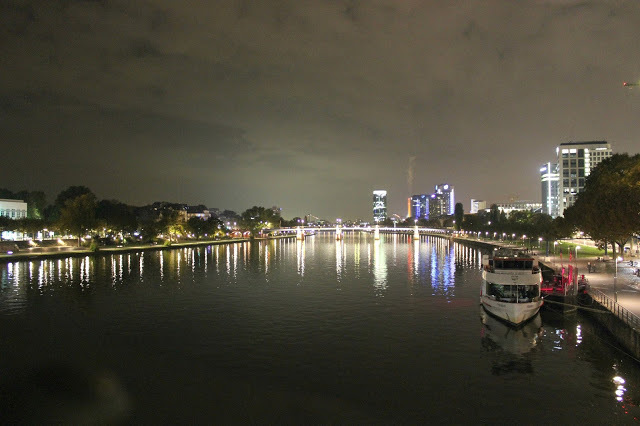 So, let’s walk together and discover Frankfurt in Germany! 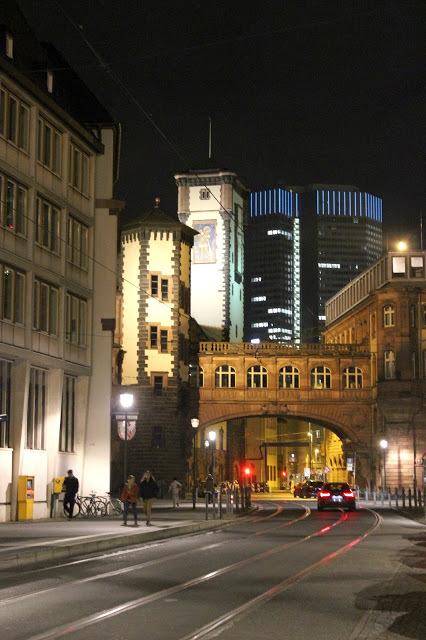 Frankfurt am Main, the largest city in the German state of Hesse, is a global hub for commerce, culture, education, tourism and traffic and the major financial centre of the European continent. Automotive, technology and research, services, consulting, media and creative industries complement the economic base. 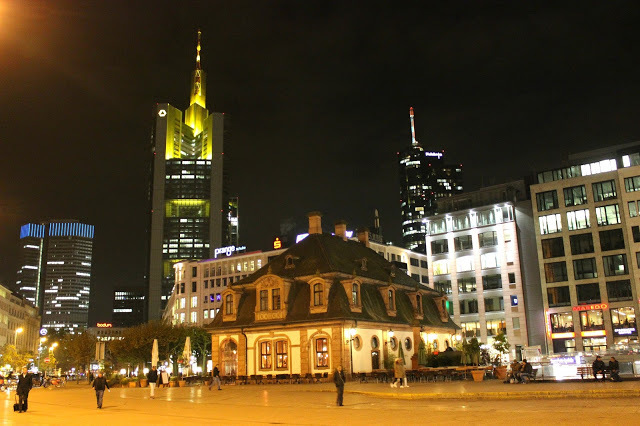 Frankfurt’s DE-CIX is the world’s largest internet exchange point. Messe Frankfurt is one of the world’s largest trade fairs. 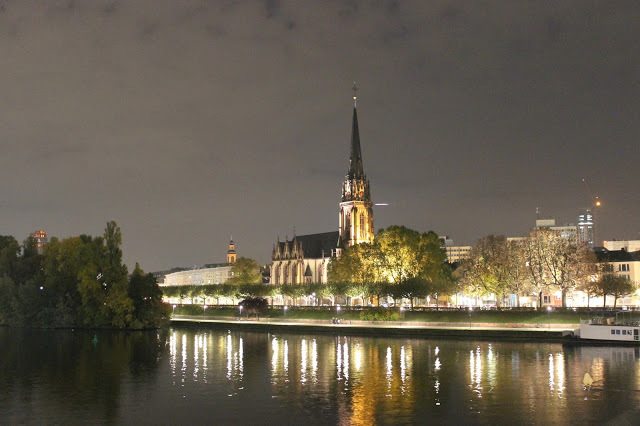 Major fairs include the Frankfurt Motor Show, the world’s largest motor show, and the Frankfurt Book Fair, the world’s largest book fair. Before World War II the city was globally noted for its unique old town with timber-framed buildings. 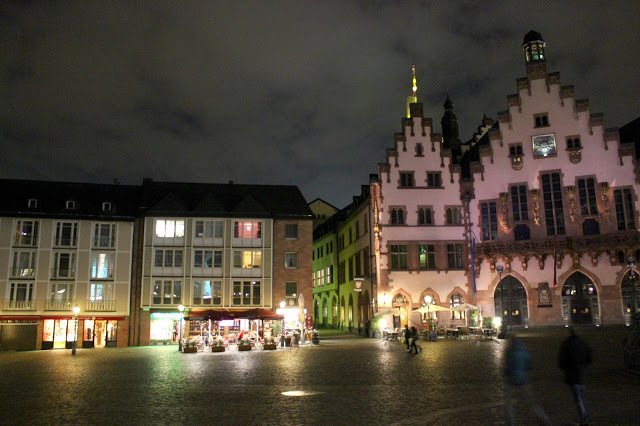 Frankfurt was severely bombed in World War II and the medieval city centre, was almost completely destroyed. Only a few buildings left and some of them are re-constructed. 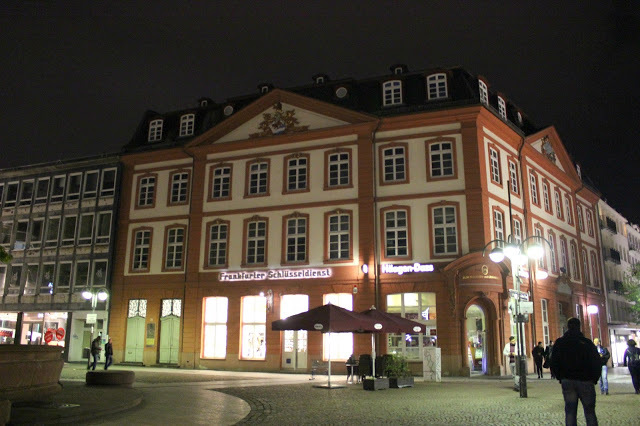 If you visit Römerberg square actually you can admire how the old town was before the war, with these amazing buildings and the cute restaurants and beer and coffee shops. Yes, you are guessing correct, I had a beer and tasted traditional dishes with meat, in on of them, and they were delicious! 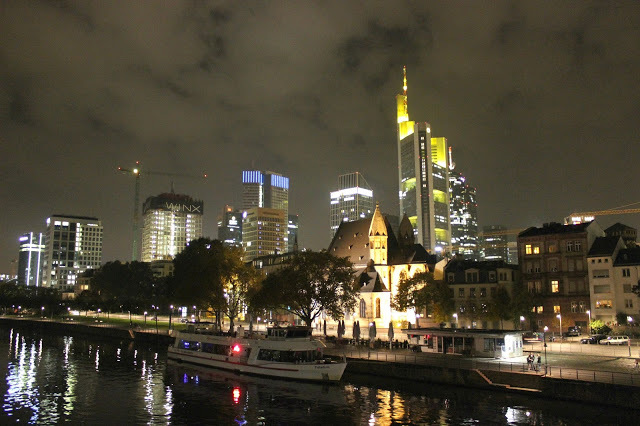 Frankfurt has many high-rise buildings in the city centre and actually is one of the few cities in the European Union to have such a skyline and because of it Germans sometimes refer to Frankfurt as Mainhattan. 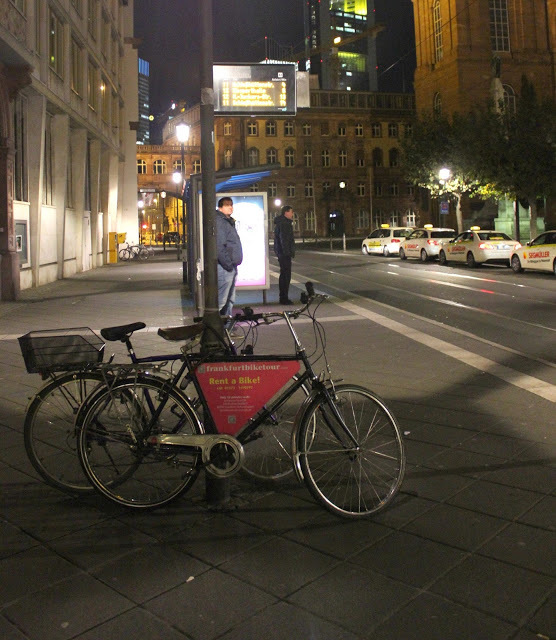 The city is something between modern and medieval. You can admire really minimal and modern buildings just next to a gorgeous gothic church. To be honest I think the modern style is more impossing that the medieval one, which actually is something really awkard and tottaly not my taste. But when you get down to the river then you can admire amazing buildings and the impressive skyline of the city and you can easily change your mind. Walking by the river was so relaxing and so beautiful, such a pieceful place! I have told you, Autumn makes this city really beautiful! 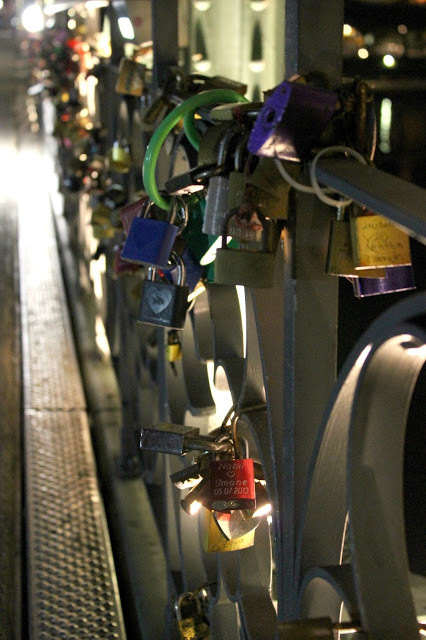 And in the bridge you can also realize that Frankfurt can also be a romantic city with a unique style! I would love to discover more of her beauties in another trip…maybe! Ακομα και οι βραδινες φωτογραφιες εχουν την μαγεια τους! Είσαι τοσο τυχερη που εχεις την δυνατοτητα ακομα και για λιγη ωρα να ξεφυγεις και να δεις κατι καινουριο μεσα απο τα επαγγελματικα σου ταξίδια. Ω ναι! Με θεωρω πολυ τυχερη γιατι εχω δει ηδη αρκετα και τα εχω λατρεψει ολα! Πόσο τυχερή είσαι Ζήνα μου..μου έχουν λείψει τόσο πολύ αυτά τα ταξίδια! Πρέπει να είναι μαγική πόλη, και δεν της τό'χα! εινια περιεργη πολη…ειτε θα σου αρεσει ειτε όχι! Γεια σου Ζήνα με τα ταξίδια σου! Να είσαι καλά να μας μεταφέρεις και εμάς όμορφες εικόνες! ω ναι! πρεπει να ειναι μαγικη τοτε! στο ευχομαι να το πετυχεις Ελεανα!